Mom's Gone Bronson! 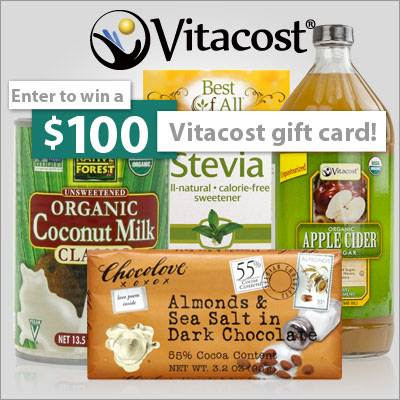 : $100 Vitacost Giftcard Giveaway! Vitacost, for whom I have an upcoming review this week, is currently offering up a FABULOUS prize to our readers, and theirs, through their latest group giveaway, for none other than a whopping $100 gift card to their site!! As you may well know, Vitacost has everything to offer from vitamins to diapers, make-up and organic products at great prices, which means that $100 will go a long, LONG way!! If you are not already a member, you can sign up with Vitacost, HERE and receive $10 (via my refer-a-friend link) when you do, to spend through the site as you please!! You can also shop as a guest and not sign up at all, it is completely versatile and up to you! You are still going to snag some fabulous items at more than fair prices AND have them delivered right to your door! To be in with a chance of winning the $100 Vitacost giftcard prize, all you have to do is enter through the rafflecopter below!! It really is that simple!! The giveaway opens on July 1st at 12am EST and will end on July 14th, 2013! SO! What are you waiting for!? Enter NOW! Good luck everyone!! Let us find ourselves a winner!! Disclaimer: I was not monetarily compensated for this post, but I will receive $10 in credit for Vitacost for everyone who signs up through my refer-a-friend link should you choose to sign up that way. This is in no way mandatory and will not affect your ability to win the prize! Mom's Gone Bronson is NOT responsible for prize fulfillment! This responsibility lies solely with Vitacost, who shall pick the winner and make contact at the end of the giveaway period! Thank you!